How to open/hide/autohide sidebar using mouse? There are quite a few useful sidebar extensions but I couldn't find any means (button, sidebar ribbon, whatever) to close that sidebar with mouse, at the very least. Perhaps, there is a special extension to do that? Is it a joke or we are really supposed to switch from a mouse to keyboard during browsing in 2016? Also, do developers actually read these fora or the latter are just for letting users' vapor out (into nowhere)? Twentysixteen. Still using a mouse to browse the web. No seriously, the sidebar button is useful. The only added the sidebar a short while ago. I'm sure one is coming at some point. Closing an item in the sidebar is easy - click on its icon again. That still leaves the strip with the icons, but I can live with that. 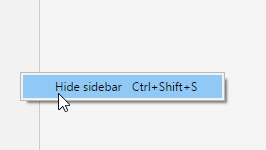 Ctrl+Shift+S will show/hide the strip. How about mimic the way OmniSideBar extension for firefox works? "- Ability to open and close the sidebar by clicking the margin of the browser window. It will glow when this feature is enabled so you know when you can click it." Wouldn't be a bad idea. yeah, on 16:9 monitors it's probably okay, I just don't like and need to have it open all the time. I do appreciate my screen real estate. Stangely Ctrl+Shift+S doesn't work on my (freshly re-installed) Windows 10 PC. Only the mouse right click works.